Confession: I asked my library to buy this audio because it won the 2012 Odyssey Award for best audio book for children. By disc two, I could tell why it was chosen for this esteemed award. Kirby Heyborne provides the voices for Rotters. You might recognize his voice from Cohn's and Levithan's Nick & Norah's Infinite Playlist. Heyborne has a young and vulnerable voice that I found perfect for Joey. Joey lost his mother and when he goes to live with his estranged father, he feels more alone than ever. There is little dialogue for much of the book and we follow Joey as he grieves and tries to figure what role his father will play in his life. When Joey learns that his father is a grave digger, things get so very interesting. Heyborne completely switches gears and provides an all new raspy and raw voice for Harnett (father). When we meet other rotters from other parts of the county, again we are blessed with all new voices. I was truly impressed with Hayborne's versatility. 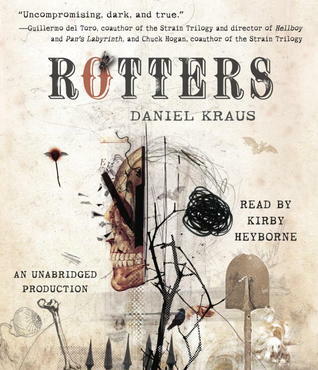 Rotters is a very emotional, dark, and twisted story, and it felt a little on the same lines as The Marbury Lens by Andrew Smith. (One of my faves from 2012) Although Rotters isn't as gruesome or terrifying, I really didn't know what else to compare it too. I was left with the same weird feeling in my stomach, and I felt like I read something that would stay with me for a long time. I immediately thought of people who I thought would love the story - I tried to remember the umpteenth million people I recommended Smith's book to. I explained the whole premise to my husband and his face continuously changed from almost horrified to complete curiosity. I think he even asked if this was meant to be a book for kids. I, of course, said hell yes! I hate to use the term "reluctant reader," but my word this book is perfect for a boy who wants more than the ordinary. Don't let the decomposed skeletons and the rotting flesh keep you mom/dad readers away. Yes, there are disgusting scenes, but Joey's heart and his changing family more than make up for the scenes where rats eat their way out of bodies. *wink* Because of gruesome scenes, language, and sexual content, I highly recommended for 15+.